For wood posts. Extends wire 5 inches from post. 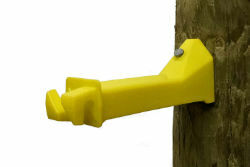 Excellent for hogging down over old field fence. Strong and sturdy. Molded of high-density polyethylene with UV inhibitors. Complete with nails. 5/16" Hole opening for wire. The length of nail in post is 1 3/4" at 45° Angle = Strong Support. Nail Size is 10D. Yellow.